The all-new Z650 features new aggressive styling, an all-new lightweight trellis frame and swing-arm, a 649cc parallel-twin engine derived from the ER, but which is now fully Euro4 compliant with more focus on low to mid-range power. The unique side-mounted shock of the ER has also been replaced in favour of a centrally-mounted monoshock with conventional linkage. The seat is now slimmer towards the tank and lower by 15mm and ABS comes as standard. We’ve just completed close to 160 miles carving up the mountain roads of Southern Spain near Seville, along with jostling with local traffic in the city. The new lighter, sleeker Z650 took on the challenge with ease. The new H2-like trellis chassis represents a huge weight saving of 10kg, the swingarm is a further 2.7kg saving. Kawasaki are quoting an overall weight saving of 17kg over the ER-6n. This means the new Z650 feels much livelier than the old ER-6n, it’s considerably lighter, easier to manage at slow speeds, but also more fun out of the city. There isn’t any more peak power, the gearing is identical, as are the gear ratios, but with improved mid-range power and less weight it feels much more alive. It’s far sportier and fun than its predecessor. The use of a conventional rear shock, centrally mounted with linkage not only improves the handling but also the ride quality. The ride isn’t as harsh. The lowered seat is narrower towards the smaller fuel tank. 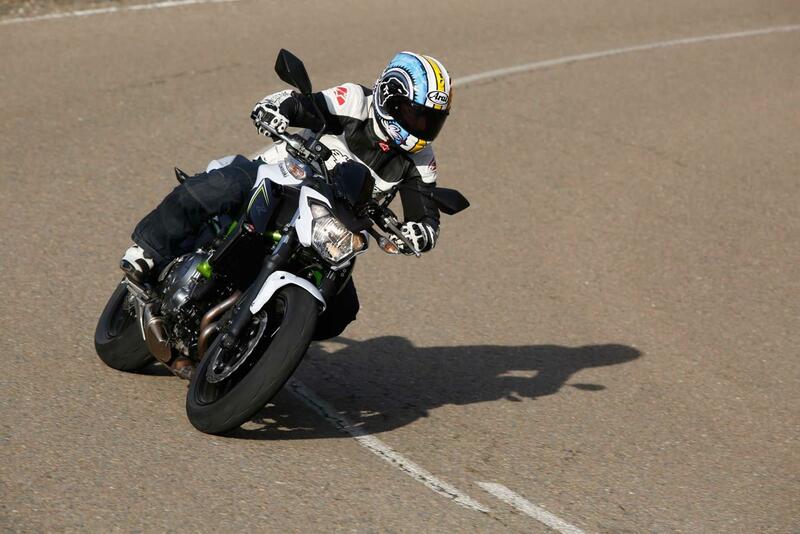 This makes the new Z650 even more accessible; I’m 5’6" and was comfortably flat footed at both sides. The pegs are in the same position therefore the distance between the seat and pegs is slightly shorter, but still comfortable and relatively roomy. Along with the lightweight chassis is a one finger light clutch and smooth gearbox, which makes town work a doddle. There’s even a slipper clutch that not only helps inexperienced riders but gives more advanced riders something to play with. Kawasaki has already taken 12,000 orders of the new bike and new models will be arriving in UK dealerships in January priced at £6099. To read the full story check out Motorcycle News, on sale Wednesday January 14.